Zaida, Pakistan: Even in his ancestral village here in northwestern Pakistan, where 23-year-old Mashal Khan was the pride of the community, the pointed finger of blasphemy made him an instant pariah. It wasn't until several days later, after a more complex story emerged implicating university officials and radical Muslim students in falsely accusing Khan, and police declared he had done nothing to insult his faith, that the villagers dared to express grief and organize a funeral. "I lost my son, my friend and my light. It shattered my world," said his father, Iqbal Khan Iqbal, a social worker and poet in his 70s. "But my greatest sorrow was that no one in the village came to offer condolences." Iqbal described his son as an intellectually curious, outspoken young man who had explored Sufi mysticism and studied in Russia but had never strayed from his Muslim upbringing. He expressed particular horror that Khan had been killed by fellow students, reportedly egged on by university officials in retaliation for criticizing official policies. Police have arrested 22 people in the case. "Universities are places of learning and knowledge," Iqbal said "If such incidents are taking place there, what can we expect from the rest of society?" Khan's campus lynching April 13 provoked an immediate nationwide uproar. It seemed to mark a dangerous new low in the intensifying religious and cultural clash in Pakistan over blasphemy, the perceived sin of offending Islam, which is also a capital crime in the 95 percent Muslim country. Prime Minister Nawaz Sharif urged Pakistanis to condemn the slaying, and the National Assembly unanimously called for new safeguards in the nation's blasphemy law to prevent its misuse by false accusers and vigilantes. But the mob killing was also the unsurprising outgrowth of recent, stepped-up hysteria over the emotional issue, magnified by social media, in which televangelists and conservative talk-show hosts have accused secular activists, bloggers, journalists and others of blasphemy. Even Sharif was denounced for his warm remarks to Pakistani Hindus during the festival of Diwali in October. Pakistan's anti-blasphemy law is harsh but generally accepted; it provides for due process and trial, and executions are rare. But often it is used as a pretext for attacks on religious minorities or personal enemies, and the merest accusation can be enough to spark punitive riots, in which crowds rampage through poor neighborhoods or drag suspects from jail. Khan's killing included both elements: It was instigated by opponents of his campus activism and liberal social views, and it was carried out by an inflamed mob. As the first such killing in a university setting, it also highlighted the spread of Islamic zealotry among young, educated Pakistanis - precisely the populace that might be expected to resist it. "A seat of higher learning was the venue. The motive was to silence a brilliant student who dared to speak his mind. The charge of blasphemy came in handy to inflame sentiments," wrote commentator Zahid Hussain in Dawn newspaper. The anti-blasphemy media campaign, he said, has emboldened accusers while cowing politicians and public figures into silence. "It reminds one of the Inquisition in Europe during the Middle Ages," Hussain said. Even as officials and politicians traveled to Zaida to place wreaths on Khan's grave, most remained wary of criticizing the anti-blasphemy law. The last official who did so, Punjab Gov. Salman Taseer, was assassinated in 2011 by his own bodyguard, who said he had acted to defend Islam. The guard was executed, but devotees view him as a martyr and continue to flock to his shrine near the capital, Islamabad. 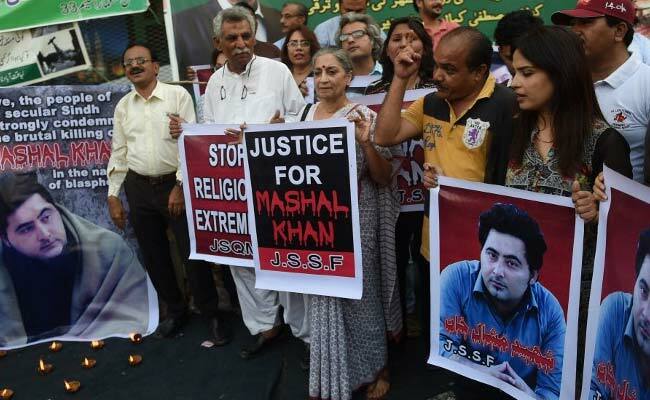 Since Khan's death, some legislators and opinion makers have pressed for legal measures to deter false blasphemy charges and the mob violence they often provoke, although religious party leaders immediately raised objections, signaling the initiative's likely failure. Sen. Rehman Malik, a strong advocate of the measures, said it was not a matter of blasphemy but of misuse of the law. "The mob cannot be a prosecutor, judge, investigator and executioner," he said. "What we are saying is that someone who falsely accuses another of blasphemy should receive equal punishment." But in the current atmosphere of fervid religiosity, some Muslims seek refuge in piety, others become righteous rabble-rousers or iconoclasts like Khan - a brash young man who had posters of Che Guevara and Karl Marx in his dorm room and advocated the rights of Abdul Wali Khan University's cafeteria workers - can be seen as dangerous deviants. Here in Khan's village, an elder named Ghulam Farooq confessed that he had been among those troubled by rumors that Khan was a blasphemer. After local clerics warned it would be un-Islamic to attend his funeral, Farooq said he did not offer condolences to the family. Once he learned the truth, however, he was angry and ashamed. "I am so upset that we are being taken hostage by a bunch of mullahs," he said. On the Mardan campus, which has been closed since the killing, several students recalled how Khan had angered officials with his criticisms and how some religious student leaders had exhorted others to oppose him on Facebook. They described how the mob burst into the journalism department April 13, searching for him and chanting, "Allah is great." Later, the attackers found him hiding in his dorm room, where they broke down the door and beat him to death. One of Khan's professors, Shiraz Paracha, called him a "shining" and attentive student who spoke up for others' rights. "This inhuman killing has left many questions about a university as a place of learning," he said. "I know it will haunt me for the rest of my life." The outrage over Khan's killing, however, did little to slow what is becoming an epidemic of anti-blasphemy vigilantism. Three days after his death, three sisters in a Punjabi village, carrying guns and wearing burqas, killed a man who had just returned to Pakistan 13 years after they said he had committed an act of blasphemy. And Friday in the remote northern Chitral region, hundreds of worshipers attacked a man after weekly prayers and accused him of blaspheming in the mosque. Police took him into custody, but people stormed the station house and demanded that he be handed over. Police officials, who said the victim might be mentally impaired, had to use tear gas and fire into the air to disperse the mob.